In an exclusive interview with the Globe, Danny — the victim of the Tsarnaev brothers’ much-discussed but previously little-understood carjacking — filled in some of the last missing pieces in the timeline between the murder of MIT police officer Sean Collier, just before 10:30 p.m. on April 18, and the Watertown shoot-out that ended just before 1 a.m. Danny asked that he be identified only by his American nickname. The story of that night unfolds like a Tarantino movie, bursts of harrowing action laced with dark humor and dialogue absurd for its ordinariness, reminders of just how young the men in the car were. Girls, credit limits for students, the marvels of the Mercedes-Benz ML 350 and the iPhone 5, whether anyone still listens to CDs — all were discussed by the two 26-year-olds and the 19-year-old driving around on a Thursday night. “Death is so close to me,” Danny recalled thinking. His life had until that moment seemed ascendant, from a province in Central China to graduate school at Northeastern University to a Kendall Square start-up. After a zigzagging trek through Brighton, Watertown, and back to Cambridge, Danny would seize his chance for escape at the Shell Station on Memorial Drive, his break turning on two words — “cash only” — that had rarely seemed so welcome. “F---!” he heard Tamerlan say, feeling the rush of a near-miss grab at his back, but the man did not follow. Danny reached the haven of a Mobil station across the street, seeking cover in the supply room, shouting for the clerk to call 911. His quick-thinking escape, authorities say, allowed police to swiftly track down the Mercedes, abating a possible attack by the brothers on New York City and precipitating a wild shoot-out in Watertown that would seriously wound one officer, kill Tamerlan, and leave a severely injured Dzhokhar hiding in the neighborhood. He was caught the following night, ending a harrowing week across Greater Boston. 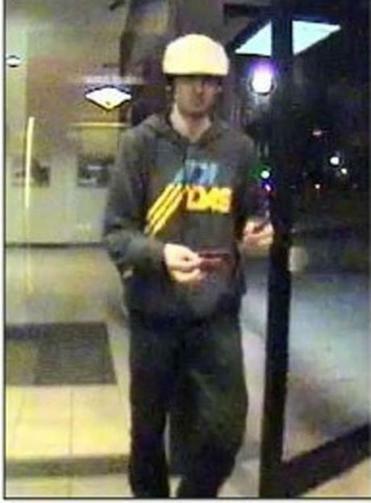 Bombing suspect Dzhokhar Tsarnaev appeared in a photo taken by a camera at a Bank of America ATM in Watertown before he and his brother engaged in a gun battle with police. Danny spoke softly but steadily in a 2½-hour interview at his Cambridge apartment with a Globe reporter and a Northeastern criminology professor, James Alan Fox, who had counseled Danny after the former graduate student approached his engineering adviser at Northeastern. “Exactly,” Danny said, though he thought nothing of the sort. It was one of many moments in their mental chess match, Danny playing up his outsider status in America and playing down his wealth — he claimed the car was older than it was, and he understated his lease payments — in a desperate hope of extending his life. 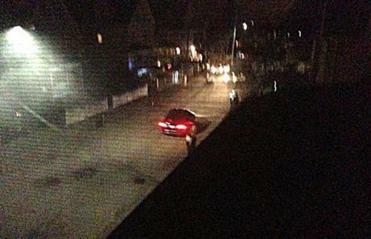 Directed to a quiet neighborhood in East Watertown, Danny pulled up as instructed on an unfamiliar side street. The sedan stopped behind him. A man approached — the skinnier, floppy-haired “Suspect No. 2” in the photos and videos released by investigators earlier that evening — and Tamerlan got out, ordering Danny into the passenger seat, making it clear that if he tried anything he would shoot him. For several minutes, the brothers transferred heavy objects from the smaller car into Danny’s SUV. “Luggage,” Danny thought. Danny thought about his burgeoning start-up and about a girl he secretly liked in New York. “I think, ‘Oh my god, I have no chance to meet you again,’ ” he recalled. Dzhokhar was back now. “We both have guns,” Tamerlan said, though Danny had not seen a second weapon. He overheard them speak in a foreign language — “Manhattan” the only intelligible word to him — and then ask in English if Danny’s car could be driven out of state. “What do you mean?” Danny said, confused. “Like New York,” one brother said. Doubling back, they returned to the Watertown neighborhood — “Fairfield Street,” Danny saw on the sign — and grabbed a few more things from the parked car, but nothing from the trunk. They put on an instrumental CD that sounded to Danny like a call to prayer. Suddenly, Danny’s iPhone buzzed. A text from his roommate, wondering in Chinese where he was. Barking at Danny for instructions, Tamerlan used an English-to-Chinese app to text a clunky reply. “I am sick. I am sleeping in a friend’s place tonight.” In a moment, another text, then a call. No one answered. Seconds later, the phone rang again. The SUV headed for the lights of Soldiers Field Road, banking across River Street to the two open gas stations. 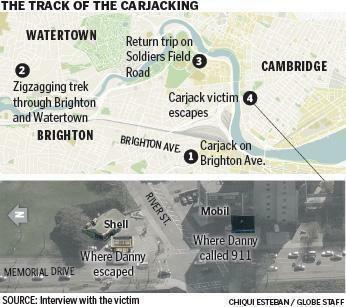 Dzhokhar went to fill up using Danny’s credit card, but quickly knocked on the window. “Cash only,” he said, at least at that hour. Tamerlan peeled off $50. The brothers took off. The clerk, after brief confusion, dialed 911 on a portable phone, bringing it to Danny in the storeroom. The dispatcher told him to take a deep breath. The officers, arriving in minutes, took his story, with Danny noting the car could be tracked by his iPhone and by a Mercedes satellite system, mbrace. After an hour or more — as the shoot-out and manhunt erupted in Watertown — police brought Danny to Watertown for a “drive-by lineup,” studying faces of detained suspects in the street from the safety of a cruiser. He recognized none of them. He spent the night talking to police and the FBI, appreciating the kindness of a state trooper who gave him a bagel and coffee. At 3 the next afternoon, they dropped Danny back in Cambridge. “I think, Tamerlan is dead, I feel good, obviously safer. But the younger brother — I don’t know,” Danny recalled thinking, wondering if Dzhokhar would come looking for him. But the police knew the wallet and registration were still in the bullet-riddled Mercedes, and that a wounded Dzhokhar had probably not gotten far. That night, they found him in a boat. When news of the capture broke, Danny’s roommate called to him from in front of the television. Danny was on the phone at the time, talking to the girl in New York.